Asking questions matters: Actor Bob Weick on running away to join the circus. Actor Bob Weick plays Papa Briquet, the weary, long-suffering ringmaster and owner of the circus in He Who Gets Slapped. We extend the invitation to all of our actors, collaborators, and artists to share their thoughts on our PAC blog, and we were so delighted that Bob had a lovely portrait of his own journey to share alongside his portrayal of Papa, and his exploration of the play's themes on today's political climate. How do we begin again? How can we remake our lives? How do we face the inevitable pain that comes with this brief gift of life? Must we run away from our past? How do we throw off the chains that hold us back? And, should we somehow find the courage to do so, where do we go? What awaits us on this new adventure? Should you ever find yourself asking these questions, remember, "the circus turns no one away". The story being told in He Who Gets Slapped, though written in 1916, is one we can still connect to today. Along with a great deal of humor and evocative music, we witness the horrors of class warfare. "One of the many benefits of wealth....you can get away with anything". "The rich buy up everything and lock it away." The dehumanizing view of women as property: "Just put her in a pretty dress." The fear of loneliness and aging. "You are not young or beautiful. What does it matter what you want." The ever present threat of jealousy, despair: "There is only one thing for you.... To forget." All this and more can be experienced in this production. How we live our lives matters. Asking questions matters. Theatre has a special way of reminding us to look at the ourselves and the world we inherited. A world we will pass on the others. Join us as we tell a tale of the beauty and courage to be found in life ... and in death. Bob Weick in an undated photo, courtesy of Kaki Burns. We've worked with a number of tremendously talented photographers over the years -- look no further than David Comdico's stunning images of the men aboard the Tall Ship Gazela in The Sea Plays or his etherial black-and-white portrait of Chris Coucill's Timon of Athens. 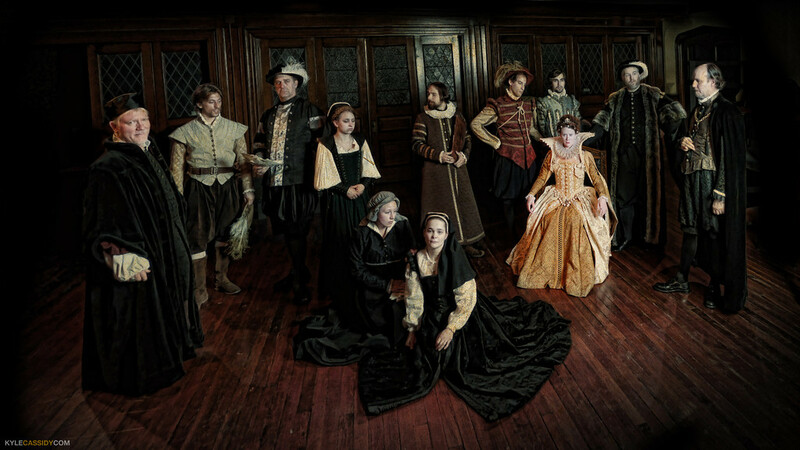 We've jumped up and down excitedly when collaborating with Kate Raines (yielding images such as our eerie, falling bride of Blood Wedding), and there was simply nothing else to do when viewing Kyle Cassidy's Vanity Fair-style portrait of our actors in Mary Stuart but gasp, and have it framed immediately. So photographer Ashley LaBonde had some tall shoes to fill when tackling the promotional shots for "He Who Gets Slapped" -- during which we asked her to arrive at our space, capture images of the actors on a tight schedule after being thrown into makeshift costumes, and document the process. Her work continues to astonish and astound us, and some of our favorite images from that shoot are the behind-the-scenes candids of makeup artist Jessica DalCanton hard at work, or the glimmering moment when actor Bob Weick, killing time before his costume fitting, began practicing a hat trick. The decision to photoshop her images into the poster design was directly inspired by the painterly quality that she brings to the table, yielding our oil-painting poster with our actors' faces, perfectly captured by Ashley. Enjoy this gallery of images, and don't miss HE WHO GETS SLAPPED.